Are you thinking about investing in a new HVAC system for your home in Marshville, North Carolina? Among the options on the market, a geothermal HVAC system can provide your home with cooling, heating and even hot water. In other words, in can function as an air conditioner, a furnace and a water heater. But there’s even more to love. A geothermal HVAC system is also highly efficient, which means it helps you save both energy and money. In fact, it’s 300 to 500 percent more efficient at heating than conventional HVAC systems. That’s because its primary source of energy is free. It’s a renewable and clean source of energy, too, which reduces your environmental impact. There’s one factor that distinguishes a geothermal HVAC system from any other type on the market: its power source is the Earth. There are two different kinds of geothermal energy to consider, including low grade and high grade. The Earth’s pressure produces heat that’s known as high grade geothermal energy. This isn’t the energy a geothermal HVAC system uses. Low grade geothermal energy is stored in the Earth’s crust as solar energy. This is the energy that geothermal HVAC systems use when they cool, heat or provide hot water for your home. The ground loop is the component of the geothermal HVAC system that collects energy or releases it. 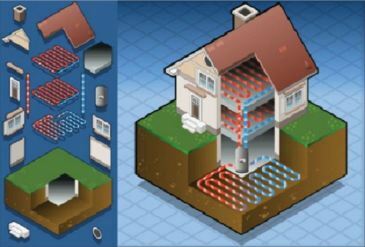 There are numerous configurations, but all of the geothermal HVAC systems follow the same principle: they facilitate the exchange of heat between a fluid and the ground. The different configurations are known as open or closed loops. An open loop takes ground water and discharges it after it has transferred the heat to your home. Closed loops, on the other hand, comprise a continuous network of underground pipes where a mixture of water and a refrigerant circulates. Most homes in Marshville with geothermal HVAC systems have closed loops. The NATE-certified service technicians at Byrum Heating & AC, Inc. have more than 20 years of experience installing geothermal HVAC systems. Whether you want a water-to-water, split or packaged system installed on your property, you can count on us to make sure it operates efficiently for years to come. Contact us today at 704-208-4165.